Rentals Lessons Repairs About Us Ask Us! The Minor Chord has one of the largest displays of hand percussion in Massachusetts! We are an approved dealer for Meinl, a globally respected manufacturer of all categories of hand percussion. The Meinl instruments are well-made and available at many price levels, from beginner to professional. 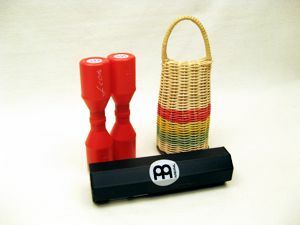 Meinl offers a special selection of children's percussion under the "Nino" name. These are quality instruments in smaller sizes suitable for younger players - perfect for the rhythm-and-motion activities that music teachers suggest as a child's first introduction to music. The Meinl percussion catalog is so comprehensive that we cannot possibly stock all of their models and styles. Come in and get your copy! We can get anything from the catalog, with usual delivery in 1 to 2 weeks. 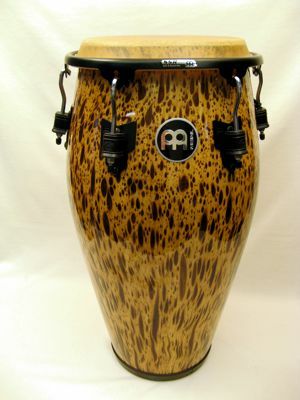 Congas are large Afro-Cuban hand drums popular in musical styles such as salsa and rhumba. They are usually played in sets of two, three or four with each drum tuned to a different pitch. Like many hand drums, the player can produce a variety of tones delending on how the hand strikes the drum head. 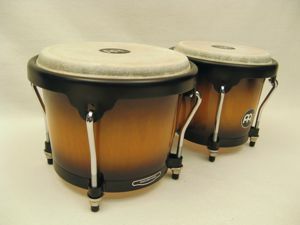 Bongos are small single-headed Afro-Cuban drums that are always connected in pairs and tuned to two different pitches. They are used in many Latin music styles, especially salsa and Cuban son, often in combination with congas. The cajon (pronounced "kuh-hone") is a box-drum that originated in Peru. African slaves, unloaded onto the docks in Lima, could find only packing crates to use for percussion instruments, thus creating the Afro-Peruvian tradition of box drumming. Cajons are versatile but affordable instruments. The front panel is equipped with a snare, and the side panels produce open tom-tom sounds. 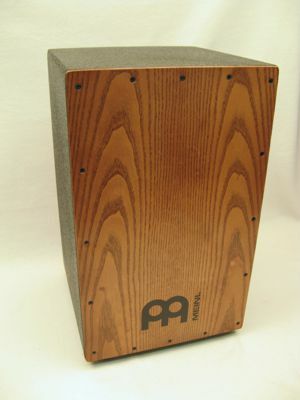 A good cajon player can produce most of the tones of a full Western-style drum set! Check out our Cajon Demonstration video for examples of how this instrument sounds. 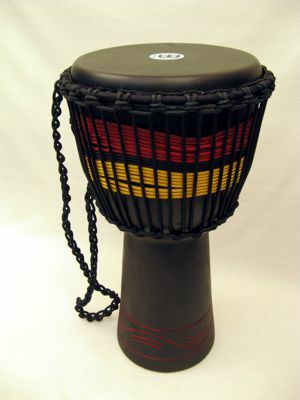 The djembe is a traditional drum from West Africa. Its goblet shape and relatively large size offers a wide range of tones, from a deep boomy bass to a crisp slap tone. 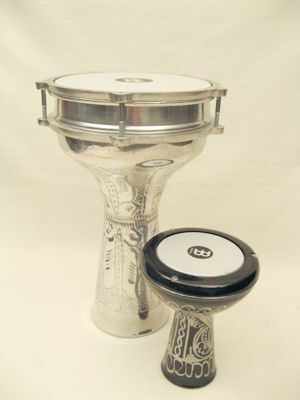 You will find both traditional rope-tuned and modern hardware-tuned djembe models in the marketplace. Because the djembe player secures the drum between their legs, we find djembes with hardware-style tuners to be very uncomfortable. We therefore stock only traditional rope-tuned models. Tambourines are available in an astonishing array of styles. 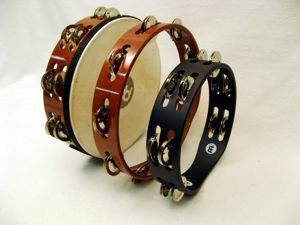 They can have a drum-head or not; different numbers of jingles; different frame materials; and jingles made of various metals. Each combination creates a different sound. Check out our Introduction to Tambourines video for examples of each style. 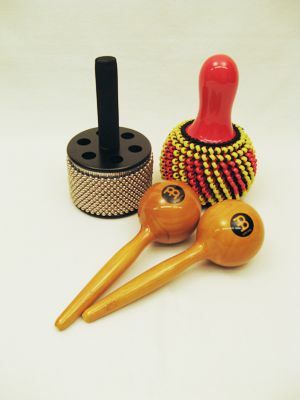 Shakers are simple and inexpensive percussion instruments that can add a lot to your "groove". Even a simple shaker egg makes its presence known during a performance. As with tambourines, there is a huge variety of shakers. Check out our Introduction to Shakers video for examples of some of them. 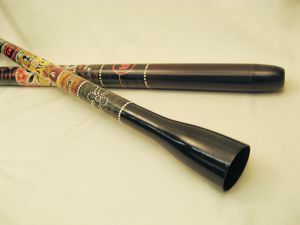 The didgeridoo is blown with buzzing lips like a brass instrument and produces a low, warbling tone. Experienced players use a circular breathing technique so that they can extend the sound indefinitely. These are traditional drums from the Middle East and northern Africa. There is evidence that these goblet-shaped drums were played more than 3000 years ago in the ancient kingdoms of Babylon and Sumeria. Doumbeks and darbukas are played with a much lighter touch than African drums such as the djembe and have a higher, crisper pitch. The categories above only scratch the surface of hand percussion possibilities. We invite you to visit The Minor Chord and see it all! Check out our Afuche Cabasa video for an example of one of our interesting hand percussion instruments. © 2018 The Minor Chord. All rights reserved.